The new menu is available starting April 4. LEON announced the launch of its spring menu, drawing inspiration from Asia and the Caribbean. 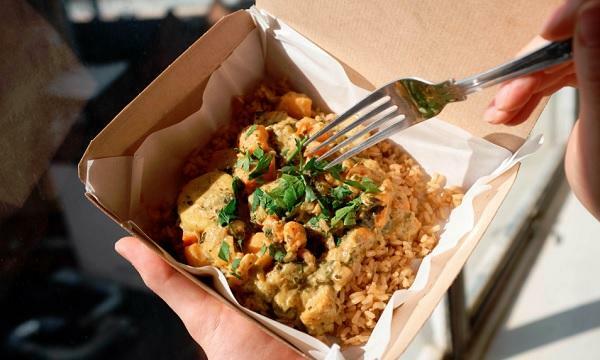 New dishes in the range include a Caribbean vegan plantain curry and a home-style Thai curry that came from a recipe of food writer Kay Plunkett-Hogge. The Caribbean plantain curry is a spicy mix of sweet potato and plantain, finished with lime and habanero chillies. The item is taken straight from the pages of LEON’s latest cookbook Fast Vegan. Plunkett-Hogge’s curry is made with British chicken thigh, aubergine, baby sweetcorn and bamboo shoots. LEON currently has 63 restaurants, 54 of which are in the UK.